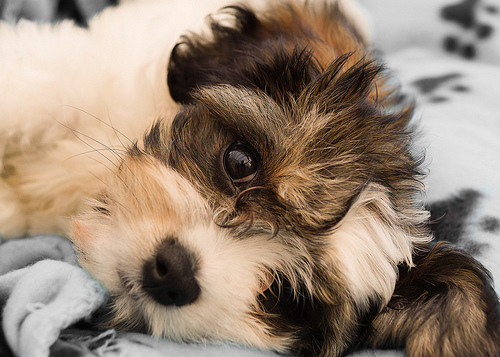 Pets Costs > Dog Breeds > How Much Do Cavachon Puppies Cost? How Much Do Cavachon Puppies Cost? The Cavachon, which was considered an accidental mating, is a cross between the Cavalier King Charles spaniel and Bichon Frise. While some may call them “designer” breeds, they are actually a gloried mutt; don’t let anyone tell you differently. These puppies are considered designer puppies because they are popular companions, especially for those who are suffering from allergies. Cavachon puppies have large expressive eyes and have a sporty appearance. These dogs are affectionate, loving, and gentle and are also family oriented, usually getting along with children and other pets in the home. The price of Cavachon puppies will depend on the quality, breeder, age and geographical location. Premium grade Cavachon puppies can be priced anywhere from $400 to $2,200. Most purchases, however, will be between the $400 to $900 range. Since this dog is a “mutt,” per se, don’t let any breeder trick you into making claims about the puppy’s appearance, temperament or size, because it’s hard to predict this with any mixed breed. The Three Oaks Farm, for instance, offers its puppies for $1,650 and an additional $300 to ship it via an airline. This breeder will include a health certificate, baby blanket, puppy food, toys and a crate. Pawster.com notes you will often find designer dogs that will be within the $1,500 to $3,500 range, but if you find a breeder who understands a Cavachon is a mixed breed, the costs should be in the $400 to $800 range. Any legitimate breeder will include a health guarantee, health registration papers from a qualified vet, up-to-date vaccinations and a travel crate if shipped. Some breeders may also include a starter pack that includes dog food, toys and other miscellaneous care materials. If the dog has to be shipped via an airline, this can be an another $150 to $350, depending on the airline and how far it has to travel. Recurring costs will include food, toys, accessories and routine/unexpected vet visits. Plan on budgeting at least $75 to $100 per month to take care of your dog. Due to it long coat, it’s recommended you take it to a groomer at least once per month to have it groomed and bathed. Doing so can keep the dog from matting and the areas underneath its eyes short to avoid staining. Even though it’s quick to learn commands, some owners opt for obedience classes. The average class, depending on where you go, can cost about $80 to $100. It can weigh up to 13 to 20 pounds and measures 12 to 16 inches tall, depending on the parents. It’s considered to be a small dog, but out of all toy breeds, it’s one of the largest. The coat is fluffy, thick and can be quite curly, measuring up to five inches long. This breed will shed very little and can be a great selection for those who do suffer from allergies. While the coat colors can vary, the most common will include a shade of white or brown. Other colors noted include tri-colored, sable, black and tan. It will exhibit an appearance that’s similar to the white purity of a Bichon Frise and the multi-colored coat of a King Charles. These dogs tend to be very energetic, animated and are very loyal to their owners. It’s best that these breeds aren’t left alone for long periods of time because they can easily become bored. Since these breeds can tend to have teeth problems, it’s best to bring them to the vet so that they can get their teeth cleaned. Regular brushing is also required due to the type of coat that they have. Its temperament is known to be very gentle and has a strong urge to please its owner, but it can vary from one to another since it’s considered a crossbreed and will act similar to its parents. Known to do very well with children of all ages, the Cavachon can along with virtually anyone and anything. Due to its size and personality, it won’t need a lot of space to play and run, making it a great option for a condo or apartment. This breed is known to have few health problems such as ear infections, heart problems, hip dysplasia and vision issues. These health conditions will all depend on the parents and the genetics they inherit. It’s known to live up to 15 years with a healthy diet and proper veterinary care.